For years, Bela has fought for more humane public spaces in his hometown of San Francisco, where he helped launched Park(ing) Day, a now-global initiative to convert street parking spaces into miniature public parks. When he came to Hong Kong to curate the latest Detour design festival, he was dismayed by the city’s “twentieth century” approach to designing streets, which treats them as traffic funnels instead of public gathering spaces. With the help of co-curator Justine Topfer and Detour creative director Aidan Li, Bela assembled an international crew of designers to challenge Hong Kong’s approach to public space in engaging ways. 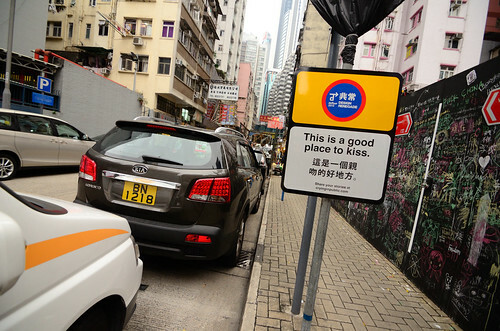 The result was “Design Renegade: Prototyping Public Space,” a two-week event held last December at the recently-decommissioned Wan Chai Police Station. In addition to lectures, concerts, a design market and exhibits inside the police station, a vacant lot across the street was transformed into an urbanist’s playground. 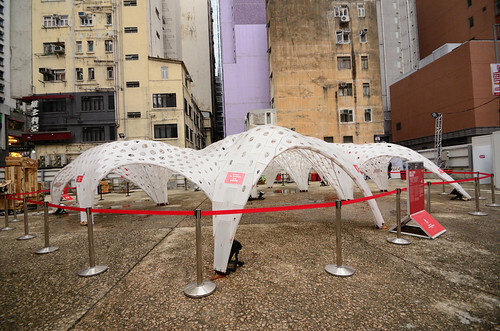 In one corner of the lot, Hong Kong-based designers Andrew Kudless and Riyad Jouck built a star-shaped plastic canopy whose undulating structure recalled the waves of nearby Victoria Harbour. 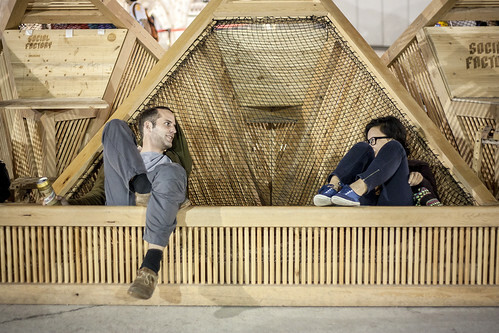 Nearby, German design collective Raunlabor contributed a wood pavillion that captured rainwater, commenting both on the scarcity of fresh water in Hong Kong—nearly all of its drinking water is imported from mainland China—and the role of water as a magnet for civic gatherings. 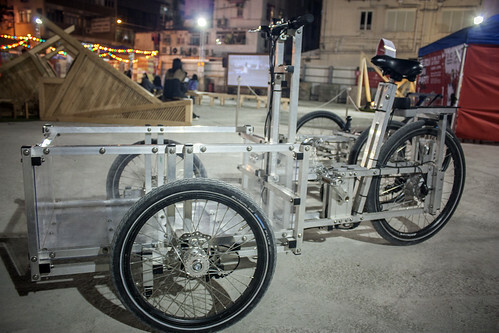 Danish collective N55, inspired by the bicycle deliverymen of Wan Chai and the hostile conditions faced by Hong Kong cyclists, invited the public to build cargo bicycles with local materials, which they then pedalled around the Detour side with obvious glee. And in the centre of the site, the Cave Workshop built a spectacular hammock-like structure whose geometric form was based on the growth of construction projects in Wan Chai over the past several years. 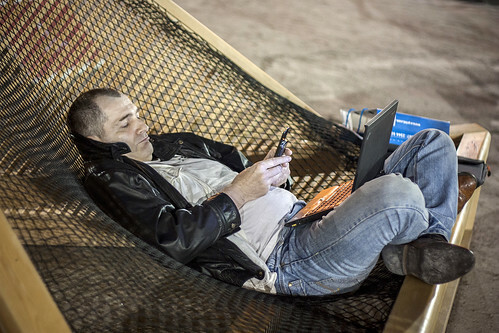 It proved a popular resting spot; people chatted, ate, worked on notebook computers and took naps. As usual, one key aspect of the most recent Detour was its site. Every year, Detour takes place in a disused public building; former venues include a Victorian-era prison and a 1950s police dormitory, which are now being converted into a contemporary art centre and a design hub, respectively. 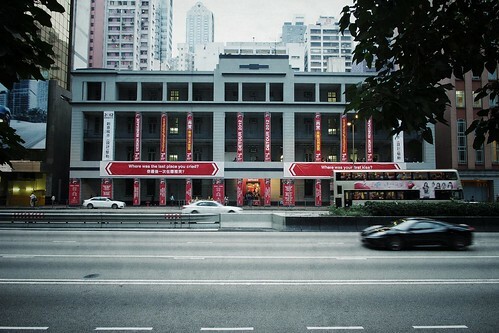 Built in 1932, the Wan Chai Police Station was only decommissioned in 2010, and it still feels as though it is in use — as if all the police officers have stepped out in unison for a smoke. (“Walking inside, it felt like I was in a 1980s John Woo movie,” says Chu.) In one of the exhibits inside the station, University of Hong Kong architecture students envisioned how the site might one day be redeveloped. In a sense, that’s the kind of city proposed by Detour: collaborative, interactive and responsive to local social and environmental conditions. It stands in contrast to the normal, top-down, bureaucratic way of doing things in Hong Kong, which many feel has contributed to the city’s worsening air pollution, unaffordability and widening wealth gap. But the “Design Renegade” approach to city-building is still not a reality. As if to underscore this point, one of the festival’s key installations, Kudless and Jouck’s Shell Star Pavilion, was roped off and declared unsafe for public interaction by government inspectors. “It’s telling of what happens in Hong Kong — it’s this microcosm of what cultural projects have to deal with,” says Chu. This story will appear in the February/March 2013 edition of Surface Asia magazine. This entry was written by Christopher DeWolf , posted on Monday January 28 2013at 06:01 am , filed under Art and Design, Asia Pacific, Heritage and Preservation, Public Space and tagged Design, Detour, Festivals, Hong Kong, Redevelopment, Social Design, Urban Design, Wan Chai . Bookmark the permalink . Post a comment below or leave a trackback: Trackback URL.